Once-sharp SUV loses its edge, despite being safer and more spacious. The first-generation Forester quickly carved itself a reputation as the sharpest handling compact SUV around; a comparatively lithe, responsive entrant in a segment littered with dynamic duds. But functionally, the Subaru was hamstrung by its compact dimensions and tight packaging. Rear-seat leg room was severely restricted, and, as family transport, it was compromised to say the least. Enter gen-two. New Forester has grown in every dimension. Its body is 75mm longer, wheelbase has grown by 90mm, it's 60mm wider and 110mm taller. The result is greatly improved space for all passengers in all directions, including a big 109mm gain in rear-seat leg room. The rear doors also open wider to improve entry and egress. NVH improvements include framed doors (a Forester first) and additional sound deadening in key structural areas. The list of standard safety kit, including ESP and dual front, side and curtain airbags, had judges nodding in approval. It came as no surprise to learn the Forester is a five-star ANCAP crash performer. The fact the new Forester launched in Oz at the same price as the outgoing model - despite this significant equipment upgrade - was also applauded. The judges were less than impressed, however, with the Forester's interior. Cheap-feeling plastics and a lack of design flair left most feeling cold. "Interior is cheap," scribbled Robbo. "Too many contrasting finishes." But despite concerns over its interior presentation, judges were largely impressed with the Forester's overall functionality. "Practical and unpretentious," wrote Jonathan Hawley, succinctly. And so to the driving, where Subaru's historical strengths lie and where the promise of a new double-wishbone rear suspension heightened expectations. Instead, this is where the Forester's COTY charge unravelled. Overly soft suspension delivered a supple ride (probably the best of any vehicle here) but also a lack of body control and a disturbing tendency to alternate between understeer and roll oversteer during hard cornering. At three-quarter pace, the Forester feels neutral and predictable, but flirt with the limits of adhesion and any sense of poise evaporates. "Inconsistent grip levels," said Robbo. "Understeers, bites, then understeers. Lacks body control." 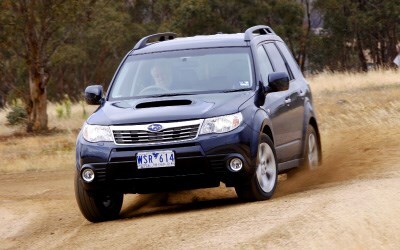 The kick-back-prone steering copped a hammering in the pages of the judges' books: "Steering is vague and approximate," read my own notes, while Robbo's disappointment only deepened: "Steering too slow and vague - doesn't steer like a Subaru should." The naturally aspirated four also came under fire. Outputs of 126kW/229Nm don't seem anaemic, but fail to translate from spec sheet onto the road. There's a lack of fizz below 4000rpm, a problem compounded by the four-speed auto. Speaking of which, eyebrows were raised at a $40K SUV using a four-speed automatic. Points in the Value and Technology criteria were duly deducted. The turbo XT ups the power stakes to 169kW/320Nm, bringing a welcome boost in mid-range punch, but the extra grunt also overwhelmed the chassis. Several judges complained of hairy lift-off oversteer behaviour. Then the rain came. And with it, thunder, lightning and hail. In the slippery conditions, the Foresters' ESP was all at sea. Once the front end had pushed wide (which it inevitably did), the electronics were too often caught napping, before panicking and biting too aggressively, unsettling the car and spooking most judges: "Not at all sure-footed," said Bulmer. In truth, much of the blame can be laid at the tread of the XT's rubber. "Those Geolandars would have to be close to the worst piece of rubber ever!" raged Newton. The Bridgestones fitted to the lower level models actually offered better wet-weather grip, but still disappointed. In fact, if there's one word to capture the Forester's 2008 COTY campaign, it's 'disappointing'.